There are millions of video slots around (you won’t find more in any casino other than ours though) but a video slot based on a single song – well, that takes some thought. Ganapati from Japan have done that too, however – with a video slot themed around a fictional Japanese musician called Pikotaro and his Pineapple Pen, an instant Youtube hit with views way over the 170 million mark. Pikotaru, in reality, is Japanese comedian Daimaou Kosaka, and thanks to Ganapati he gets his spot of honour with PPAP, a video slot entirely themed around him. PPAP comes with 5 reels, 40 paylines and lots of pineapples, and pens too. There are Wilds that award you respins, a Free Spins feature with extra wilds, and some rather juicy multipliers in a minigame where you get to pick apples. This is the world of Ganapati: their video slots not only bring a lot of Japanese culture to a new audience, but they are also built with particular themes and look, and indeed feel, different to those of many others. While you might not be familiar with Pikotaro, there’s still quite a good chance to score wins and dance to the tune of Pineapple Pen. But hopefully, you’ll do that on your own without anyone seeing you. Spin on the reels of PPAP with a minimum bet of just € 0.4, going up to a maximum of € 120 per spin. The good news is that the return to player percentage is rather high, at more than 98%, so the chances of winning are indeed rather big. Every time you land a Wild, a pen, apple or pineapple symbol is added to the PPAP meter to the right of the reels, and you will also trigger a free respin. Once all the four letters have been filled, you enter a bonus round where you have to throw a pen through them (yes) by selecting them. You get three apples with three prizes each. The prizes behind every apple will also be revealed, and you will also find out what was hidden behind the others. So while you might feel a little frustrated at missing out on a bigger prize, there are no blank or “x” apples so you’re sure to score a win or two. Extra spins will be added if more wilds land during the respin, up to a maximum of three for every round, and there is also a separate free spins feature that you can also retrigger. The Free Spins feature is triggered by the PPAP symbol, a bonus icon that takes you to the Free Spins whenever three of it land on the reels. You will get five free spins, but with four or five bonus PPAPs you will get 7 and 9 free spins respectively. During the Free Spins, there are extra wilds which make it easier to earn winning combinations and trigger the Respins feature, and while the Free Spins cannot be triggered anew, the Wilds make this mode potentially rewarding. Pikotaro’s sunglasses, scarf, shoes and designer watches are the lowest-paying symbols and you’ll need at least three identical symbols on a payline to score a payout. These lower-paying symbols start from an amount of 5x, 10x, 40x per line, with the watch being the highest paying symbol at 5x, 25x or 60x. 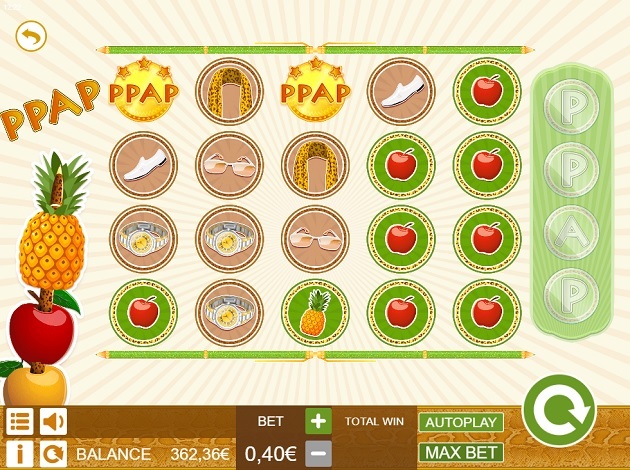 The pen earns you up to 200x for five of a kind, while the pineapple goes up to 300x and the top prize is the red apple, with a whopping 500x your bet per line. The Wild symbol is represented by the “singer” himself and substitutes all regular symbols to create a winning combination. Each Wild has a pen, apple or pineapple attached to it, and that will count towards filling the PPAP meter. PPAP is bright and colourful with an abstract background. The symbols are designed rather simply yet clearly, and in general, the reel set looks very clean indeed. You can activate autoplay and quickspin modes, and surprise! you can choose to turn the music off too. PPAP runs smoothly on OS and Android portable devices, besides desktop. PPAP is a very original game which comes with very interesting features, such as Wilds bringing you respins and bonus games. In addition, there’s a rather high RTP to reckon with – so there’s a lot of exciting potential in this video slot by Ganapati! The world of online games is filled with inspiration from Japan and its culture, traditions, symbols and events – but most of them are based on what we read or hear about in general. If you are a player who enjoys a real experience, from the very land that serves as an inspiration, then you are in the right place. Finally, we have a game supplier that brings the true Japanese culture, both old and new, to the online gaming sector, with an insight that most other suppliers don’t really have when it comes to Japan. The main focus is still that of delivering the best gaming experiences for players all around the world – at every production. Today Ganapati has reached an international status, with offices in London, Tokyo, Los Angeles, Malta, Estonia and Romania. They have made it their mission to use the expertise gathered in the global network for everything from entertainment and film, to music, animations, and games – all combined with Japanese design, themed plots, and high-quality technology to supply the iGaming industry with an attractive, captivating and unique gaming content. Ganapati is much more than just games – offering diverse products of game studios, media platforms, and production companies.